From birth, babies begin exploring the world around them with their eyes. Even before they learn to reach and grab with their hands or crawl and sit-up, their eyes are providing information and stimulation important for their development. • Helping their child develop his or her vision by engaging in age-appropriate activities. eg. providing hIgh-contrasting black-and-white images, which are easiest for baby to see in the first three months of life, is a good start for nurturing baby’s visual development. Significant improvement occurs during the first few months of life. The following are some milestones to watch for in vision and child development. It is important to remember that not every child is the same and some may reach certain milestones at different ages. From birth to about 3 months of age, babies’ eyes do not focus on objects more than 8 to 10 inches from their faces.While they may look intently at highly-contrasted images or objects, they have not yet developed the ability to easily tell the difference between two objects or move their eyes between the two images. Their primary focus is on objects 8 to 10 inches from their face or mum and dad’s faces. Although an infant’s colour vision is not as sensitive as an adult’s, it is generally believed that babies have good colour vision by five months of age. By the age of nine to twelve months, babies should be using their eyes and hands together. At around 9 months of age, babies begin to pull themselves up to a standing position. By 10 months of age, a baby should be able to grasp objects with thumb and forefinger. By twelve months of age, most babies will be crawling and trying to walk. Parents should encourage crawling rather than early walking to help the child develop better eye-hand coordination. Babies can now judge distances fairly well and throw things with precision. By two years of age, a child’s eye-hand coordination and depth perception should be well developed. Children this age are highly interested in exploring their environment and in looking and listening. They recognise familiar objects and pictures in books and can scribble with crayon or pencil. Read or tell stories to nurture and stimulate baby’s visual development and pave the way for learning and reading skills. 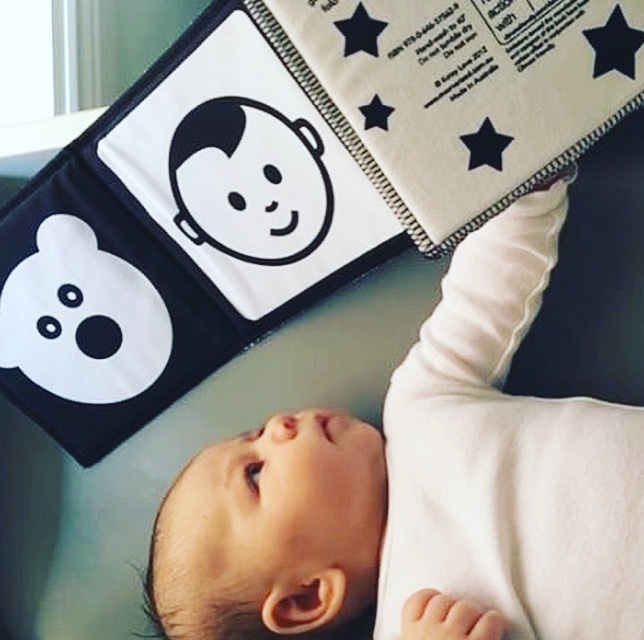 HIgh-contrasting black-and-white books or images are easiest for baby to see at this age. Keep toys within your baby’s focus, about eight to twelve inches.